I am very proud to have this quilt made by my mother (who has passed away) when she was 12 years old. I am sure that the blocks were mail ordered and she worked very hard to complete the quilt. Each block is a story in the Old Testament with a picture of the story. Then the last block is her name and when she made it (1927). Source: My mother's loving hands. That was called "red work" It was very popular in it's time. You could send for the patterns, buy them in the dime store, or trace a pattern from the newspaper. There was some green work and blue work but the red was the most populat. Yours is lovely. Your Bible Quilt is very lovely. Do you or anyone know if the pattern can be found today? I would like to have one if possible. I am trying my best to order the pattern but having no luck. I would really like to work the quilt for myself. I remember seeing the little booklets that these patterns came from. My grandma and old maid great aunts did a lot of these. You ironed the page, a lot of the dishtowels I have tucked away were done this way. I use the plain old white ones, not the treasures of my ancestors, yet the reason they did it was for household use. Go figure! Dear Elaine, How lucky you have such a nice treasure in your mother's quilt. I admire the work she put into it. To bad girls are not taught how to do hand work anymore. It is a lost art in most families these days. Lilac, yes, I did know this was called "red work". I would imagine that they got it from a newspaper, they didn't have much money to be buying anything. Doing the handiwork is a lost art Great Granny, It is sad to see it go. I have no idea where you could find this kind of pattern again. Wish I could find it again also, it could be a money maker for church's who raffle off a quilt I would think. I did not find where you can purchase them but I did find this doing a google search. Maybe if you looked further you could find a source. 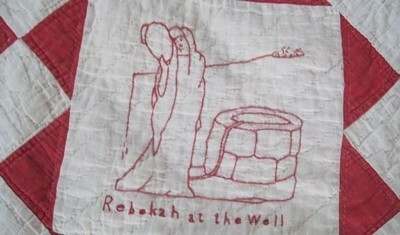 The Bible History Quilt, by Ruby Short McKim, was originally published in newspapers in 1927. The scenes will tell the story in simple outline stitch of twenty-four Bible characters or events. One pattern was printed each week, and the reader would carefully cut and save each piece until they had a complete quilt set. These patterns were highly valued, many of them surviving for collectors and quilt historians of today. It has the ones you have in the quilt. Lovely quilt and there are lots of redworkers still out there. It is an art I enjoy doing as well. 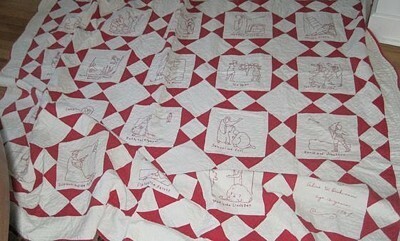 Although the quilt is a treasure, I am confused as to how your mother died when she was 12. Did she have you at that very young age? 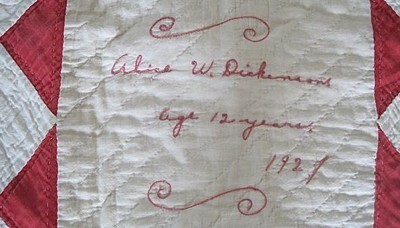 Editor's Note: I believe her mother made the quilt at 12, and has since passed away.